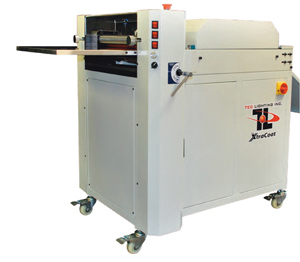 This machine is a work horse and can help your clients lower their cost of marketing material production at half a penny for a 12” x 18” sheet. Like all UV Coating Machines, the most important thing to remember is to properly clean them after every use to ensure proper function and optimal performance. When you purchase your machine through Lloyds of Indiana, we will make sure you are up and running in no time. We will always be there to help you maximize its performance and do any repairs as needed. Of course, you will need UV Coating Fluid for your Mini. We recommend REVO Coatings Low Odor coatings. 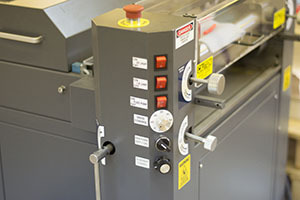 If you are putting your machine in a small space, the low odor-high quality finish from REVO Coatings is 2nd to none. Need more detailed information? 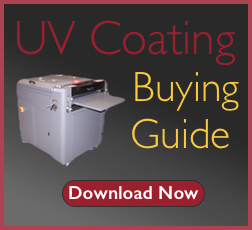 Download our UV Coating Buying Guide.